Bollywood actress Dia Mirza, who is known for her acting chops, is also in the news for her social work. The diva, who is married to Sahil Sangha, co-owns a production house ‘Born Free Entertainment‘ with him. She is also known for her style quotient and can easily make a simple dress look like couture wear. Dia recently attended the News 18 Reel Awards 2019 where she looked flawless in a slinky black one-shoulder gown that is truly a unique one. We loved the way she kept the whole thing simple and gave an edge of class to the entire look. 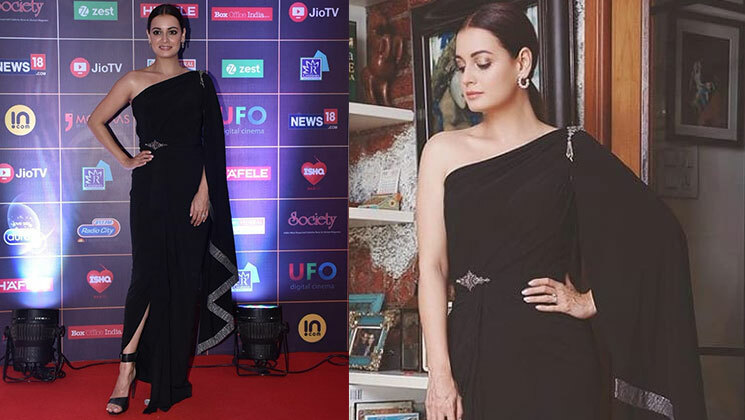 Dia Mirza was dressed in a black Shantanu-Nikhil gown for the awards night and she slayed us with her dazzling style. She accessorised the outfit with some diamond studs and rings along with a brooch. The accessory went well with the tiny diamond detailing on the waist and the shoulder. Instead of studs, you can use chandelier earrings. The gorgeous actress had added oodles of mascara and a hint of coral to her lips (to add that colour to her look). Some glitter on the eyelids will also go well . Black sandals added the much-needed style quotient for it. You can even opt for silver stilettos. Dia has truly left us mesmerised with her classic look.